Buster Keaton, like Chaplin, will forever be respected as the most basic and fundamental pioneer of the comedy genre in film. But rarely mentioned with Keaton is how wonderfully composed and experimental he was with regard to creating action cinema, as well as a real and serious sense of physical vulnerability. And no, we’re not talking about thrillingly empty car chases, or crazy cinematic gun battles, but of something much simpler; something much more basic and pure to cinema. Using comedy as a cushion, and action as a cold, hard, wooden floor, Keaton often successfully constructed lovingly warm films that are sure to make you smile, yet also sure to make you rub your head, whispering a faint “Ouch” as you do so. Keaton’s world is comedy at its most painful. Steamboat Bill Jr. (1928) perfectly demonstrates Keaton’s love for action set pieces; a deeply impactful sense of danger and peril fills many of the film’s most effective scenes. 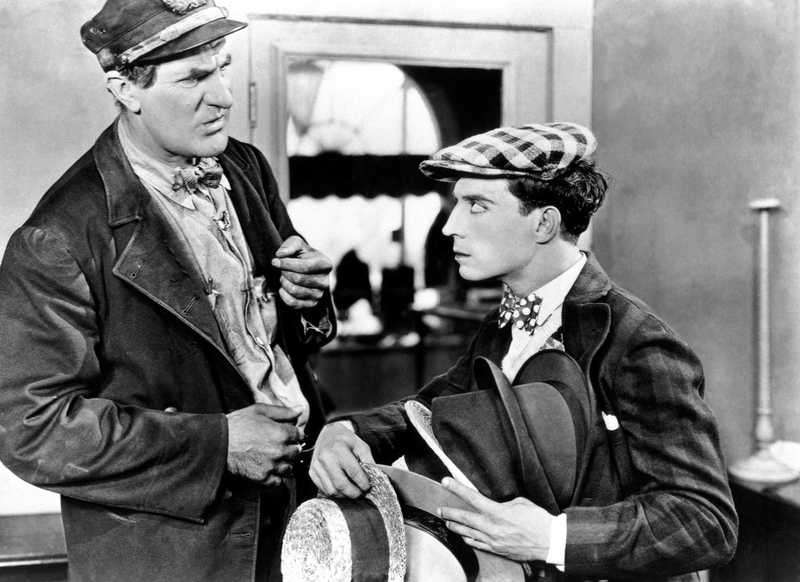 Yet, at its heart, the central story of Steamboat Bill Jr. is one of love and kindness, and its identifying tone is one of hyperactive tomfoolery, and cartoon-flavoured frivolousness. The film’s basic plot follows Keaton as William Canfield Jr., visiting his childhood home after years away studying. However, when William reunites with his father (William Canfield Sr.), he is greeted with shame and disappointment. William’s father sternly believes that years of studying has undoubtedly softened-up his son, making him less capable to stand up for himself, or to survive within the tough, modern world. This newly established parent/child dynamic between William and his father is sometimes extremely awkward to watch; we feel and understand the coldness in both men, but yet, can’t restrain from finding the situation they find themselves in completely hilarious. For example, during one great scene in a hat store, William’s father attempts to replace his son’s much loved Beret for something a little less sophisticated and artistic, and a little more “ready-for-tough-labour” looking. In a manner not far-off from Scottie’s controlling observational obsessions in Hitchcock’s Vertigo, William Sr. frantically attempts to find his son what he perceives to be manlier looking headwear. In a single, undisturbed two shot, William tries on dozens of different hats, each seemingly maddening his father closer towards a cartoon styled frustration, and each increasing his anger and belittlement towards his son’s own sense of style and personality. The scene pulls the two men together physically within a slightly less awkward and unfamiliar space, while, concurrently, ripping them even further apart mentally. Another hugely important element in the film’s construction arrives in the form of Kitty King, William’s cute, but rather one-note love interest from school. The couple find themselves in the same town for the same reason; each is visiting their respected father, who both own commercially run steamboat rides on the local waterfront. William and Kitty are soon caught amidst a confrontational competition between their fathers’ steamboat ride trade; they become harshly separated, and are eventually banned from contacting as a result of their fathers’ increasing spite for each other. Keaton and his director perfectly capture and control this situation metaphorically, by placing closely together the two family steamboats, end to end. The space between the two standing boats then evolves into a forbidden, outlawed line that only heightens the thrilling and comedic impact of later scenes, which find William hopelessly and impractically caught within the space. The film’s dreamy story of forbidden love does leave a long-lasting impact, but it’s far from what makes a film like Steamboat Bill Jr. so special. The film’s most magnificent moments arrive in what can only be described as “peril comedy”, a major step-up from the silly slapstick moments that would usually fill silent comedies of the time. This was Keaton placing himself in huge amounts of danger for the sake of his art, just as he had done in The General (1926) two years earlier. Some of the bizarre ways in which Keaton dives, tumbles, and crashes in the film brings you to wonder how on earth he didn’t just break his neck doing it. One famous scene sees Keaton very narrowly avoid being crushed by a two-ton segment of brick wall, with no safety measures in place, and with no trick effects. In a way, the film’s central narrative conflict could be more suitably summed-up as “Keaton vs. death”. If for nothing else, Steamboat Bill Jr. must be highly respected for Keaton’s wonderfully dangerous and committed performance. As you laugh your head off in glee, you’ll also squint your eyes in empathised pain. 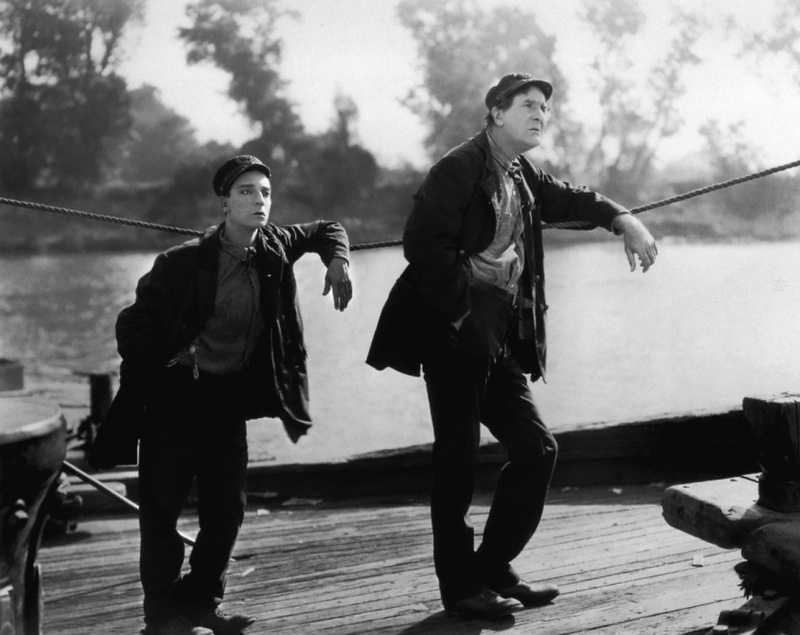 Steamboat Bill Jr. stands tall among the bravest and most courageous of Keaton’s films; to witness his stunning performance is a real treat for the senses, one that’s sure to stick within the bank of your most treasured of cinematic memories. Come for the blissful feelings of beautifully connecting with a newfound love, stay to watch Keaton almost kill himself on several occasions. It has been a long time since I have seen this, but I am a great fan of ‘The General.’ I agree that many of these films have a cartoon feel about them, perhaps because of the exaggerated expressions, making up for the lack of sound. I do prefer Keaton to Chaplin in most instances, mainly for the reasons you state. He took a lot of chances to make effective and believable cinema, often at great personal risk, and he is to be applauded for that.